This anthology brings together twelve essays by scholars, writers, and artists reflecting on the role of the “I” in Chicano and Latino culture and the diverse ways in which personal voice and experience inform their research. 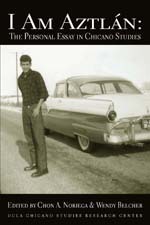 "This collection of essays represents an important and worthwhile contribution to the growing field of Chicano/a autobiographical and non-fiction writing. The volume brings together Chicano/a, as well as Puerto Rican and Cuban American, writers and artists who demonstrate a common interest in exploring the intersections of personal and social history. Instead of reifying Chicano/a identity into recognizable traits for the purposes of definition, this collection explodes stereotypes of a 'typical' Chicano/a experience by highlighting the internal tensions surrounding the ideological struggle to define an authentic Chicano/a experience. . ... The collection of essays concludes with a very helpful and useful bibliography of Chicano/a autobiographical and personal essays, in both English and Spanish. ...it is in many ways an ideal pedagogical tool to introduce students to the complicated nature of 'Chicano/a identity.' The range of issues explored in this collection not only highlights the diversity of the Chicano/a community, but it does so in an accessible, familiar manner. This allows for readers with different interests to take something worthwhile from the text, making it a unique and timely contribution to the field." "[T]his collection ... shows that the term Aztlán is much more complex than right-wing critics dare to acknowledge. ... All of the pieces are quick ... leaving readers wanting more. Highly recommended. All levels/libraries." "These twelve essays by scholars, writers and artists considers the self in Chicano and Latino cultures, and how their perceptions of self and its role affects their work. They approach the subjects of exile and going home, home and work, family, and testifying by sharing memories of first learning English and white culture, what they thought of their parents' role in culture in the past and how they perceive it now, how family secrets that transcend culture still become involved in it, how life as a Chicano"